I do not have any official background in art or design, but there are certain colors that just speak to me & look appealing to my eye. In college my Freshman year dorm room was expertly curated in hot pink & neon green. There are still many left-over things in my apartment in this color scheme & it takes me straight back to 2005. When I get dressed, I pick out a base color & then mix & match colors until it feels right. This dress is in heavy rotation in my Spring wardrobe (previously worn here) & to visit wedding venues with Ty this past weekend I wanted something bright & cheerful. The pink dress + yellow sweater alone was just not doing it for me, so I searched for another color to throw into the mix. This teal necklace spoke to me from my necklace stand & when I put it on, my "color eye" was happy! The end result? A CMYK dream. How do you pick out which colors to pair in your outfits? What is you go-to color combo currently? I love this color combo, and that dress? Adorable! COLOR! Love it! 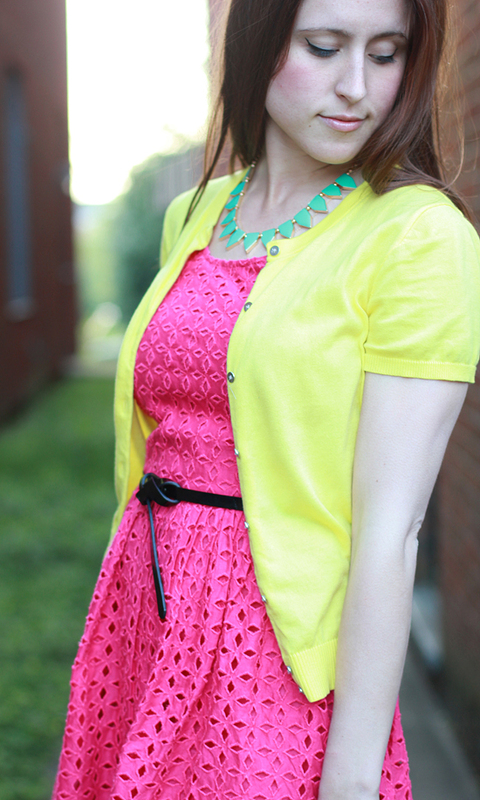 Praise the lord for spring and color and neon trends! You look great! Those colors are so fun together! And loving the dress! Hot pink and green was one of my favorite color combos growing up–I once made a "presentation" to my parents to convince them to let me paint my walls lime green. Thankfully, they said no–I'm pretty sure it would have given me a headache! That dress looks amazing on you...and I love all those colors mixed together! We were meant to be friends, because my first dorm was also very pink and green! I love pink and yellow together, it's one of my favorite color combinations. You look SO cute, I love this dress on you! what a gorgeous pop of color- l i love the dress! xO! love these 3 colors together, i would have never thought to mix them but it looks great! Love pink and yellow together! I was hoping we'd see this here after the preview on IG. I am seriously, seriously considering getting the pink version of this dress. Like I said before I have the white & navy one but you make the pink look so perfect! And I don't have a pink dress in my closet yet (I KNOW, right?!). 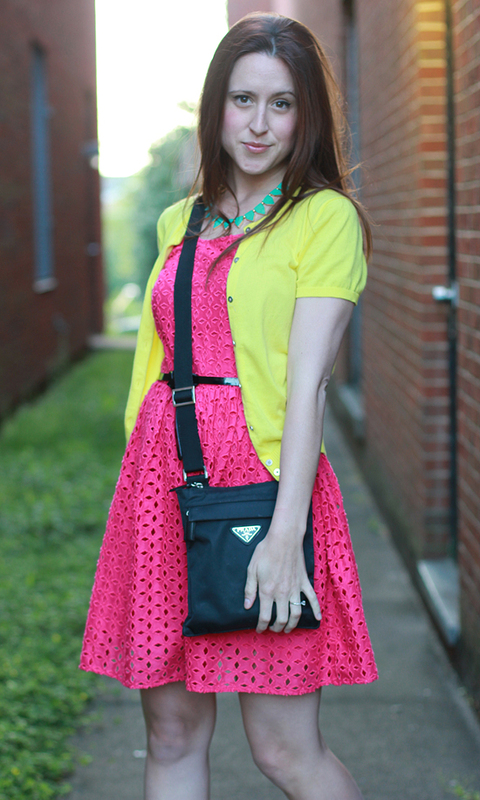 I love pairing pink & yellow and teal & yellow but never really thought to put all 3 together. Good on ya Jess! And YAY that you found a venue! That seriously makes the rest of the planning SO much easier. Are you going to share details with us here? Would love to see your planning process. Cute! Love the dress. I have the navy version and love it. Love your sandals too! You found a venue!! Yay!! Where? I love this color combo...I usually just experiment until I feel like I get it just right. And this color combo is just right!! I love the color combo! It's so bright and happy! That is such a cute necklace too. I love your hot pink dress and your necklace is so pretty as well! 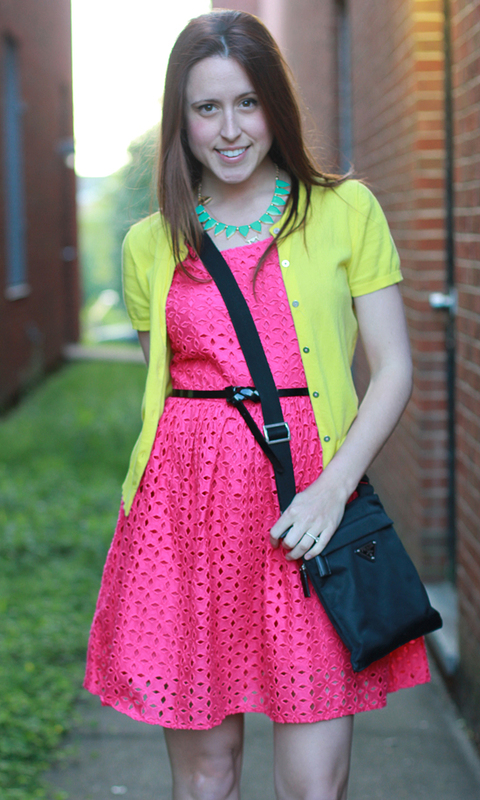 I need to go to Old Navy to get this dress! Pretty! OOO, loving the color mix! And congrats on choosing a wedding venue! How exciting!! Yay for finding a venue! It's so much easier to continue with wedding planning once this step is taken care of. Are you planning to have both the ceremony and reception there? Oh no! I would definitely try looking in your local store. I got mine last summer but spotted them out again this year... they are great quality for Target & go with everything! Yes, we are having the wedding ceremony & reception in the same space, a converted warehouse that while wasn't what I was looking for at first, just felt like The One when we stepped inside! And this dress is the perfect color to jazz up all my summer sundresses, I highly recommend it! Oooh I bet the white is gorgeous, I am a huge fan of the LWD! We are having the wedding ceremony & reception in a gorgeous converted warehouse space right here in Nashville... more details to come as the planning gets fully underway! You NEED a pink dress #FashionEnabler - so far it has been the more versatile piece in my Spring wardrobe, go figure! Yes, I will be sharing more about our wedding details as the planning gets underway. I am a perfectionist & can only share things when they are coming together/finished, lots of ideas swirling in my head currently! Peach + mint sounds so dreamy & feminine, I will have to try that one out next! Great minds do think alike! I remember thinking back then about how "evolved" & "sophisticated" my style was... I guess I will never stop learning! I highly recommend it. I was so-so about it when I first put it on, but I love it belted it & the color is surprisingly versatile! Old Navy for the win! Of course we would! Love it! haha, that sounds so cute! I always wanted to paint my walls growing up to, usually either dark gray or Barney-purple... I was an odd one! ha! I wish I had! But either way, I think it is definitely a sign!